“I enjoy working in…open [spaces] instead of being confined within the four walls of an office,” Christian Doctolero says in Filipino. Wearing a black shirt, red floral shorts, and black boots, the Business Management graduate from the University of Rizal System (URS) happily feeds the animals at the Manila Zoo. Work starts at 7:00 AM for the dusky 29 year old from Montalban, Rizal, who calls it a day at 4:30 PM. “I replaced my dad as a zoo caretaker when he passed away while in his forties,” the weather-beaten Christian says. The true-blue animal person smiles. “With my salary I help my two siblings to go to school.” That’s because he is a stay-in employee he saves much from transportation fare and avoids the hassle of commuting every day. Pushing his green food cart of assorted veggies, fish, and eggs, he feeds the turtles. Turtles of varied sizes crawl in the ankle-deep water. “At its peak, they number up to 500. People you know, find the turtles cute when they are small but when they grow up to full maturity the pet owners find it practical to just donate them to the zoo. We also set them free from time to time to various places to ease the congestion here,” he laments. 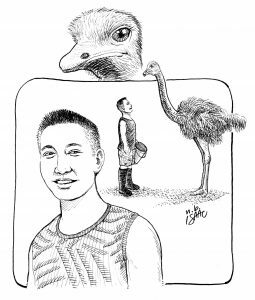 Christian then goes to the spacious cage of the flightless birds, the cassowary and the ostrich. “We used to have four ostriches but two died in PERSON2014. They were donated by a cigarette manufacturer in 2013. The male ostrich is more aggressive than the female. Years back, the male ostrich ran after me and bit me. But its bite did not hurt. But its strong kick was painful. I was hit on my right side like a kidney punch from Pacquiao,” he laughs. It is said that an ostrich when cornered can attack, a kick from its powerful legs. But its legs can only kick forward. Some facts and figures about the ostrich: Ostriches with their long necks and legs keep their heads up to 2.8 meters (9 feet) above the ground, and their eyes are said to be the largest of any land vertebrate, 2 inches in diameter helping them to see predators at a great distance. Their long eyelashes protect their eyes from sunlight. Common ostriches usually weigh from 63-145 kilograms (139-320 pounds), or as much as two adult humans. An ostrich has two toes on each foot (most birds have four), with the nail on the larger inner toe resembling the hoof. The outer toe has no nail. 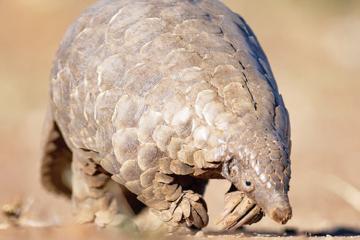 With its big legs it can run at a speed of 70 kilometers per hour, and can cover 3 to 5 meters in a single stride. 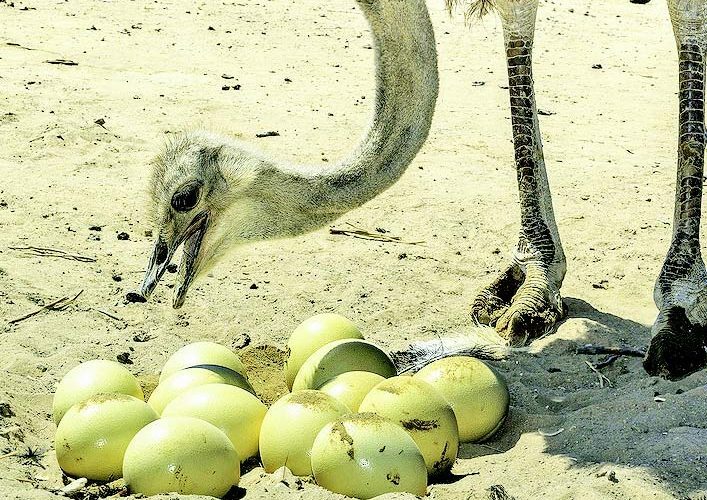 Ostrich eggs are the largest of all eggs.